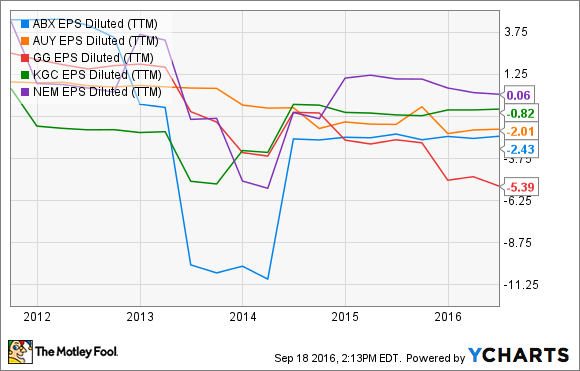 Mining Gold Stocks: Is Newmont Mining More Precious Than Its Competition? In going for the gold, you should have a clear view of the competitive landscape. Newmont Mining Corp. (NYSE:NEM) is a leader among gold-mining companies and one of the largest by market capitalization, but that's not reason enough to choose it as an investment. Let's look at some of its peers and evaluate its position among them. Its closest competitor by market capitalization, Barrick Gold (NYSE:GOLD), maintains operations on five continents; however, the company expects about 70% of its total gold production in 2016 to come from its five core mines in the Americas. At the end of 2015, Barrick Gold reported gold reserves of 91.9 million ounces; Newmont Mining, at the same time, reported gold reserves totaling 73.7 million ounces. Unlike Newmont Mining, which is also involved in copper production, Goldcorp (NYSE:GG) is a pure play on gold. Solely operating mines in the Americas -- Canada, the United States, Chile, and Argentina -- Goldcorp reported 40.7 million ounces of gold reserves at the end of 2015. Smaller than Newmont Mining, though still deserving recognition, Kinross Gold (NYSE:KGC) operates mines in the Americas, West Africa, and Russia. The company reported reserves of 33.2 million gold ounces at the end of 2015. Rounding out the peer group, Yamana Gold (NYSE:AUY) operates two mines in North America, where it has one in each Canada and Mexico. Additionally, the company operates seven mines throughout South America. More diversified in its mineral production than Newmont, which produces copper as well as gold, Yamana Gold maintains the production of three metals: gold, silver, and copper. Between the disparities in market caps and mine locations, it may seem unfair to compare these companies against each other, but there is a way we can level the playing the field: considering the all-in sustaining costs (AISC). The mining industry's version of operating expenses, AISC accounts for multiple items, such as general and administrative costs, capital expenditures associated with mine development and production, and more. Data Sources: Barrick Gold Corporate Presentation, Goldcorp Annual Report 2015, Kinross Gold Annual Report 2015, Newmont Mining Corp. Corporate Presentation, Yamana Gold Corporate Presentation. Not only did Barrick Gold outshine its peers last year in keeping operational costs in check, the company seems confident that it will be able to improve even further, squeezing ever more value out of its mines. Although Newmont appears to lag its peers at controlling its operational costs, its AISC doesn't necessarily raise a red flag. And investors should remember that this is just one metric to consider among several. Having identified some of Newmont's leading competition and how well they control operational expenses, let's delve deeper into the financials. 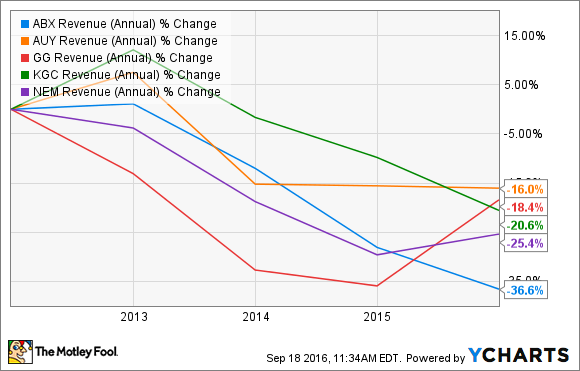 First, we'll take a look at the companies' sales figures over the past five years -- in what has been a challenging gold market. Because of the disparity in market cap among the companies in the peer group, it would be deceiving to solely look at how much the companies are reporting in sales. Instead, we'll get a truer sense of how well the companies are performing by looking at each company's growth. Over the past years, the price of gold has dropped more than 13%; likewise, gold companies have struggled to grow revenue. As a result, when evaluating the companies in this peer group, we're looking for which company has suffered the least. Apparently, it's the two companies with the largest market caps that have found it the most difficult to keep up with the falling price of gold. Unlike Barrick, however, Newmont has succeeded over the past year in finding a way to turn the ship around and grow sales -- something that only it and Goldcorp have managed to do. In considering mining companies, one shouldn't overemphasize revenue growth, though. When the gold market goes south, some companies will curb production and try to improve efficiency in order to better handle the lower gold prices. 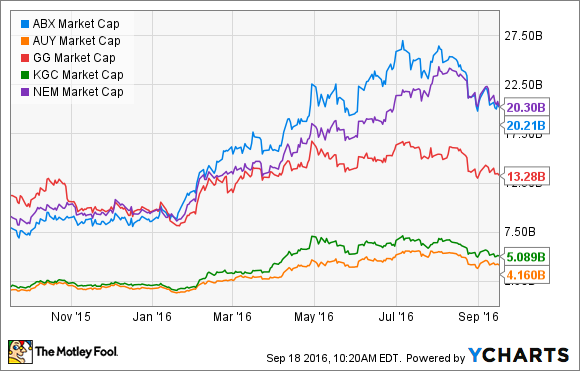 So let's skip down toward the bottom line to see how well Newmont Mining stacks up against its peers. Considering only the company's earnings per share, one might conclude that Newmont is the most successful at turning its gold to green. But this would be quite misleading. Though it's certainly a figure worth considering, the mining industry is a complicated business. Valuing a mine, for example, is far from an exact science. It's not uncommon for companies to report significant goodwill and asset impairment charges; consequently, earnings per share figures may misrepresent how well the company is actually operating. A better choice would be to examine the companies in terms of their free cash flow. A metric much less susceptible to accounting tricks, free cash flow is something which many investors consider to be more reflective of a company's true performance. Looking at how well these companies have improved in generating free cash flow, one finds that Newmont -- the only company to report positive EPS in this group -- is also the least successful at growing its free cash flow. Barrick Gold and Goldcorp further illustrate the danger in only looking at EPS. The two companies reported, respectively, EPS declines of 154% and 316% on a trailing-twelve-month basis over the past five years. However, looking through the lens of free cash flow growth tells a much different story. 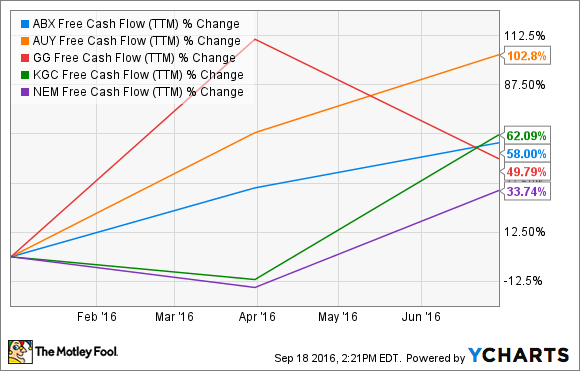 On a trailing-12-month basis, Barrick Gold and Goldcorp have grown free cash flow by 58% and 50%, respectively. As one of the world's leading gold producers, Newmont offers many compelling reasons for investment. But before picking up shares -- of any stock -- it's imperative that investors appreciate the company's competition. Conservative investors may be drawn to Barrick Gold -- a company, similar in size, to Newmont, for what it lacks in EPS it makes up for in free cash flow. This isn't to say that Goldcorp, Kinross Gold, and Yamana Gold don't also warrant consideration. But any interested investor would certainly need to dig deeper and mine the financial statements.